It’s about that time again, eh? 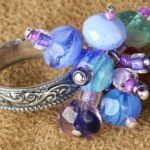 Let’s take a little peek at what was most popular on FaveCrafts during the month of May, including some new projects you might not have seen before. 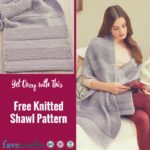 But first, refresh your memory by catching up on the Top 5 Crafts of April, and don’t miss the FaveCrafts Most Popular Craft Projects: May 2011, where you’ll also see what was HOT on AllFreeCrochet, AllFreeKnitting, and AllFreeSewing last month! Who doesn’t have a bunch of empty water bottles lying around? 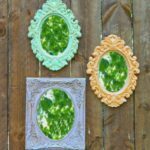 Relieve your guilt by recycling them into fun craft projects–we’ve got a whopping 14 in this collection! 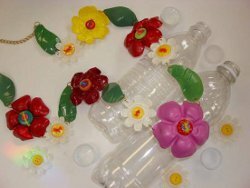 If you use reusable water bottles, you can still try these fun ideas by using other kinds of plastic bottles and bottle caps. You won’t believe some of the stuff you can make with bottles! 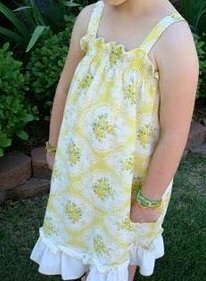 We added a bunch of new sewing patterns for girls’ dresses recently, and this was one of my favorites. It was one of your favorites in May too! I know what you’re thinking–this doesn’t look like it only takes 20 minutes to make. But the secret is in the pre-ruffled fabric. All that’s left for you to do is cut and sew. I’m so glad that this project made it into the top 5 last month. Why? Because it’s mine! You may recall that I showed you how to make it during National Craft Month in March. 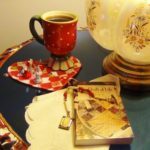 The popularity of the petal skirt, which is both easy and thrifty, really shot up when I featured it in a newsletter in May. This skirt may not be for everyone, but it sure is fun to look at (and you really won’t believe how cheap it was!). If there’s one thing I’ve learned this spring, it’s that you guys LOVE birdhouses! This collection features 11 of our favorites, some of which can be made with plastic bottles (your other favorite)! Among the runners up were the Net Stitch Camisole, the White and Cream Ruffle Dress, and the Crochet Angel Shawl. Which was your favorite? 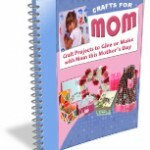 Don’t forget to check out the full collection of May’s heavy hitters in FaveCrafts Most Popular Craft Projects: May 2011! I don’t know about you but I love trying out new trends. Blame it on the day job but sewing trends are no exception. That’s why I often seek what’s “trendy” in the sewing world. From spending hours (8 a day, 5 days a week to be exact) absorbing all things sewing, I see a lot of what’s out there. Here, I’ll share my findings with you! 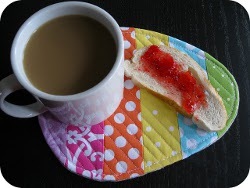 I found this helpful round-up on Sew Mama Sew and was off to add more trendy projects to our site. For Women: Seems like everyone is going for the pretty, effortless look. Try longer, flowing skirts this spring. What do you think is trendy this season? 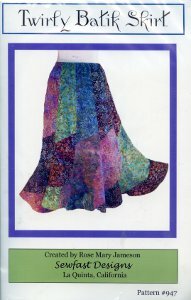 The inspiration for this skirt came when Rose Mary was visiting friends in the Santa Fe mountains. She fell in love with the Artist’s colony and thinks most of New Mexico is an artist’s vision of heaven. We’re giving one away to a lucky winner! Learn more and enter for a chance to win! Contest ends May 6, 2011. 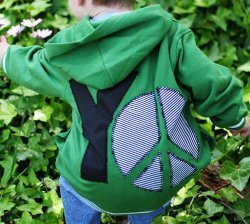 I’m a huge fan of homemade kids’ clothes, probably because I would dress like a child if I could get away with it. 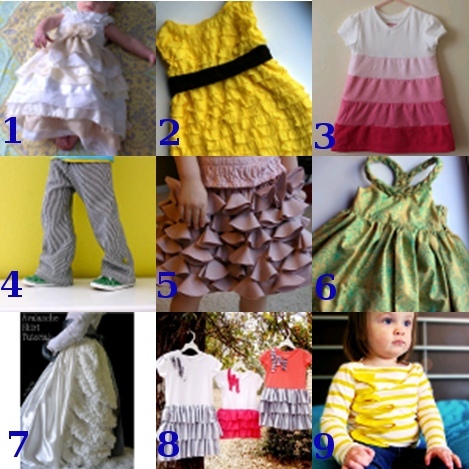 Kids get to wear the best stuff: Ruffles! Cartoon characters! Bright colors! Plus, their clothing is so much faster to make (and cheaper too!). 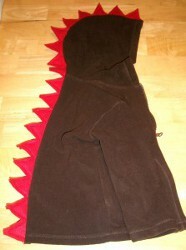 If I had kids I’d spend even more time behind my sewing machine. Here’s some inspiration for ya! Winter Wonderland Baby Couture from Kojo Designs. 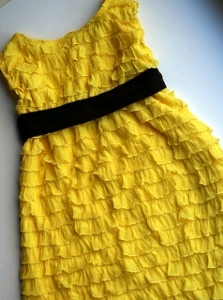 20-Minute Ruffle Dress from Me Sew Crazy. 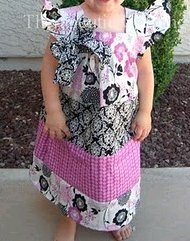 Tiered Toddler Dress from Obsessively Stitching. Bustle Skirt from Sun Scholars. Braided Little Girl’s Dress from Me Sew Crazy at The Girl Creative. 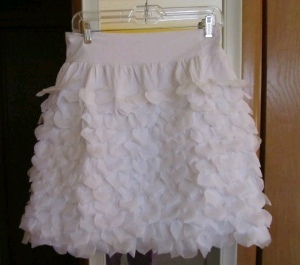 Avalanche Skirt from No Big Dill at Project Run and Play. Springtime Ruffles Dresses from Morning by Morning Productions. Scribble Shirt from Schwin and Schwin. Sewing with t-shirts seems to be all the rage these days. If I had a nickel for every sewing project I’ve ever stumbled across that calls for an old t-shirt or two, I’d probably have enough money to discard my sewing hobby completely and just buy couture from now on! But it makes sense that t-shirt sewing continues to dominate the sewing and crafting blogosphere; t-shirts are made out of knit fabric, which is the most comfortable and ubiquitous fabric in clothing, so why not sew with it? Plus, if you buy a huge, oversize t-shirt (or steal one from your Uncle Bernie), all you have to do is cut it below the arm pits and you’ve got a pretty large piece of jersey, all for a few pennies (if anything). We’ve all got loads of free t-shirts lying around (or hanging around, if you’re more of a closet person). They give free t-shirts away at just about every school event or activity, fund-raisers, 21st birthdays, sporting events…Basically I have more t-shirts than I know what to do with. And if you’ve somehow managed to evade the t-shirt collecting frenzy, you can always purchase a pack of men’s under shirts in bulk for a couple of bucks. I decided to round up some of the best t-shirt sewing patterns I’ve discovered in my blog-browsing time and turn it into a free eBook for all of you wonderful blog readers to download. You can download it and save it right on your own computer, or even print out the patterns you like best. 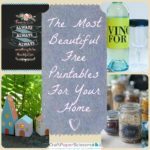 I’ve included some t-shirt embellishing projects, home decor, and accessories, all sewn from old t-shirts that would otherwise be relegated to the back of your closet or stuffed into a forgotten drawer somewhere. You can download the book here. To save time, use the bottom of your t-shirt as the edge of your project, so you have one less hem to make. If you’re making a project that requires stability, make sure you use fusible interfacing or stabilizer with stretchy fabrics like t-shirts. If you don’t have a large t-shirt collection at home and you’re scouring thrift stores for cheapies, look in the plus size or men’s department. They’re more fabric for the same price! T-shirt fabric can be ruffled just as easily as non-stretch fabric, as you can see in this fabulous pillow project. Save your t-shirt scraps (sleeves, neckline, etc.) and make t-shirt accessories from them, like this T-shirt headband or a T-shirt necklace. Knit fabric will roll and stretch nicely if you pull it tight, creating these gorgeous necklaces. Don’t put t-shirt projects in the dryer, especially if you’ve made ruffles, pleats, flowers, or other embellishments out of your t-shirts. Step 1: Measure out and mark your scarf dimensions on piece of fleece. The size is up to you, depending on if you want a long, skinny scarf, a wrap scarf, or a short cowl. A good rule of thumb is to use a scarf you already own as a template and measure according to that. Step 2: Make sure the length of your scarf is parallel with the stretch of your fabric, and then cut it out. You don’t need to finish the edges of your scarf if you’re working with fleece. Bonus! Step 3: Embellish to your heart’s desire. You can cut fringe in the ends of your scarf for a traditional look (just cut strips about 6 inches long into the ends. Again, no need to worry about fraying). You can also sew on embellishments to personalize your scarf. The All the Trimmings Scarf from Ruffles and Stuff is a great way to use up any leftover trimming remnants you have in your stash, and depending on what kind of trimming you use, it can look vintage, funky, trendy, or eclectic. All you have to do is measure whatever trimming you want to use and cut it the same length as your fleece piece. Then pin it down the length of the scarf and sew it down. 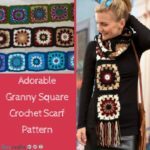 That is such an easy way to embellish a scarf, and I’m definitely putting this on my list of things to make this winter! Another fun, trendy way to embellish a plain scarf is to sew on a few ruffles. The Winter Ruffle Scarf from Blue Cricket Design is a good example of this, with tiers of ruffles along the ends. You can also sew ruffles perpendicular to the grain of the fleece, or along the entire length of the scarf. When it comes to ruffles, anything goes! Buttons, pom-poms, ric-rac, scrap fabric, ribbons, and other notions can also spice up a plain fleece scarf. Or you can play with different fleece color combinations to make a striped scarf to match your winter coat or mittens! Making a fleece scarf is such a fun, easy winter project because the scarf is as easy as cutting out a rectangle of material, and you can embellish them to your heart’s desire. Make a fleece scarf this winter to ensure that neither your neck nor your sewing machine ever gets cold. A homemade apron is usually the first project for those learning how to sew. I remember sewing two reversible aprons in high school home-ec, which I still wear. For this round-up, we’d like to share our 14 favorite free projects for making an apron. 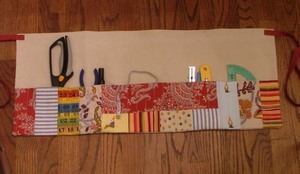 Many recycle old jeans or pillow cases to create a handy craft apron! This quick and easy apron from A Feathered Nest is quite adorable. I love the wrap around tie. This ruffled beauty comes to us from One More Moore. The coordinating fabrics are superb. 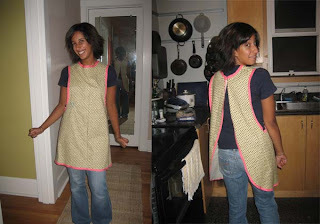 Bari J shares a tutorial for making a simple apron. She creates the most beautiful fabrics! Please visit her blog and click on the apron tutorial in the right column. 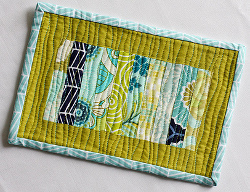 Turn a pillow case into a apron with this tutorial from raina on Craftster. Create two aprons in one with a reversible, frilly pattern from Quamut. 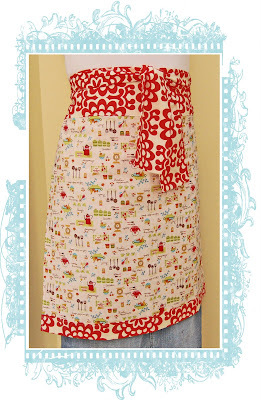 Create a full-coverage apron perfect for bakers with this tutorial from Still Dottie. A very extensive step-by-step tutorial for making a pocketed apron is provided by J Caroline Creative. I love the girly design on this apron, shared by Happy to be Called Mommy! 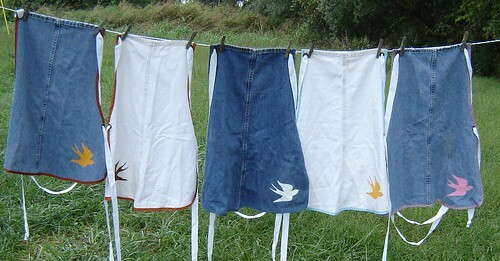 This full length apron from My Byrd House is a clever way to recycle old jeans. You can certainly create your own appliqué like her adorable bird. 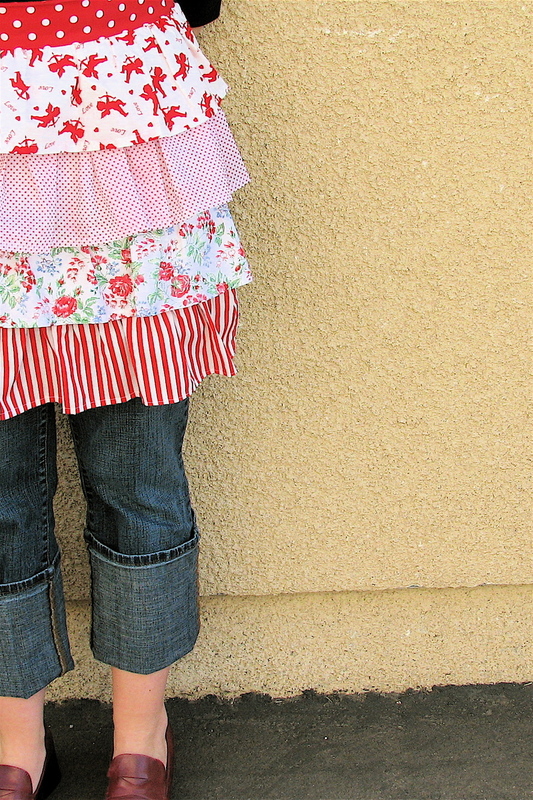 This no-sew apron tutorial from Kleas creates a crafty apron from a pair of old jeans. 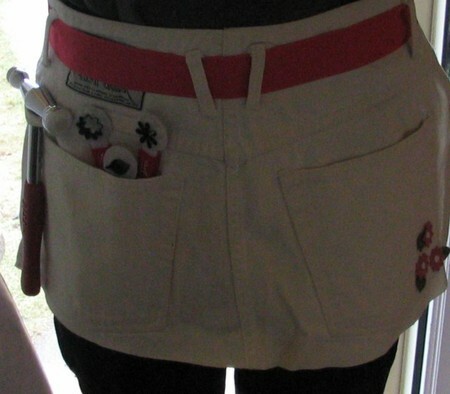 This denim Chef Apron (pdf) features pockets for quick access to cooking utensils. This apron from the cottage at frog creek is used for gathering eggs, harvesting vegetables or collecting berries or wildflowers. Unbuttoned, the full length apron is perfect for kneeling in the garden. This vintage clothespin apron is a handy tool for those who hang clothes on a line. 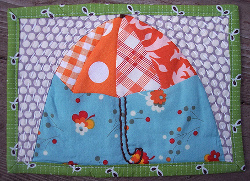 This apron from Creative Little Daisy has five pockets for the organized crafter or seamstress.